Felice Original: NEW!!! 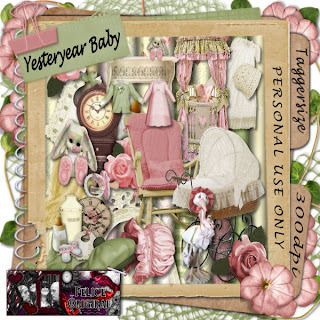 Yesteryear Baby Collection!!!! It contains a taggersize kit, a paper pack and a CU element pack. This is the second kit in my Baby collection. It's in taggersize and has a victorian theme to it. The kit contains 23 papers and 70 elements all made in 300dpi. I know you can make beautiful scraps and tags with it. This is a paperpack add-on for my Yesteryear Baby kit. It contains 15 Papers in Taggersize at 300dpi. These poser tubes are made at 300dpi. They are 1500 x 1470 pix. This pack contains the bunny in 6 poses. and on SALE now for just $1,00 each.